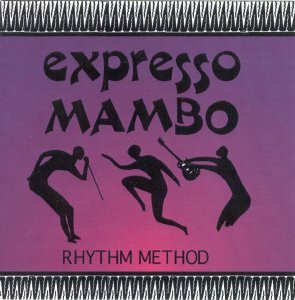 Formed in 1985 by American expat Marc Parry and guitarists Mick Finnegan and Eoghain MacCarthy, Expresso Mambo as their name suggests were dance oriented, and their music was often compared to Devo or Talking Heads, but it also contains a heavy African influence, in both rhythms and guitar styles. Expresso Mambo grew out of Max Von Rap; Mick Finnegan (previously in Nun Attax and The Antibodies) was in the lineup that recorded the "Kawasaki" single. Parry joined sometime after; later Eoghain MacCarthy and Kamla Das (ex Porcelyn Tears) both played with the band. Parry had earlier fronted Cargo Cult, an (unrecorded) soul/R&B big band (perhaps comparable to the roughly contemporary Soulmates in Dublin). Despite appearing on TV ("Megamix") in December 1986 and recording an excellent Dave Fanning Session in February 1987, the band never got as far as releasing anything beyond a demo tape, and they split later the same year when Finnegan moved to the US. Marc Parry has compiled a CD of the band's recordings. For details, contact him at P.O. Box, 1774, Santa Cruz, CA 95061, USA. Lineup: Marc Parry (vocals/percussion), Mick Finnegan (guitar), Eoghain MacCarthy (guitar), Kamla Das (bass), Johann DeWolf (drums). DeWolf was replaced by Jimi MacCarthy, then Jerry Fehily (later in Hothouse Flowers) and finally Mick Collins (ex Max Von Rap). 4 song demo tape sold at gigs. Sources: 4 tracks recorded at Elmtree Studios, Cork, recorded by Dennis Herlihy; 4 tracks from Dave Fanning session recorded at RTE Studios; 2 tracks from Gunter Berkus's 'bedroom studio', Cork; and one track recorded live during a rehearsal at Squire's Nightclub, Cork. The CD also contains two interview segments.